In these all-new adventures, the gang from Auto City learn lots of lessons about what's important in life. A Taxing Problem deals with generosity, while in Issadora's Box, self-control is needed! Extreme Overhaul shows that new isn't always best. 40 minutes. Ages 3-7. 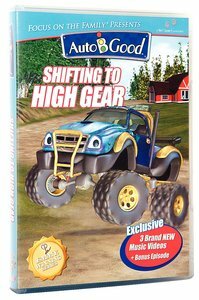 About "Shifting to High Gear (#03 in Auto B Good Dvd Season 2 Series)"
Meet the Auto-B-Good gang, a bunch of friendly cars who travel through life getting into all sorts of crazy adventures! The DVD features 6 fun stories where the Bible becomes a roadmap for learning important life lessons. Ages 3-7. Three values-building adventures with the Auto gang: Squeaky Clean - EJ learns about hygiene the hard way; Rising to the Occasion - EJ stands up to bullies; Movie FX - EJ's behaviour changes after he watches a bad film. Miles dreams of climbing mountains, but is afraid, and Izzi wants to be on the Rescue Squad, but is too small. Through hilarious adventure these two learn it will take determination and friendship to hold on to their dreams. A high octane energy drink gives EJ the "Oomph!" he needs to challenge Mr Morgan's soccer record, but when the dangerous drink is banned, EJ must weigh the price of winning at all costs. The laws of science are stacked against EJ and his dream of flying, but with the Professor's wise words about the power of imagination, EJ soars to unexpected new heights.